TORONTO, ON., (November 17, 2014) Toyota Racing won the Six Hours of Bahrain for its fifth victory of the FIA World Endurance Championship season as Anthony Davidson and Sébastien Buemi secured the drivers' title with a race to spare. 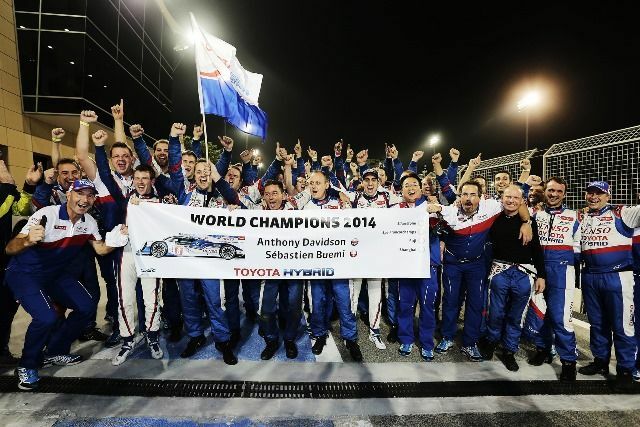 The #7 TS040 Hybrid of Alex Wurz, Stéphane Sarrazin and Mike Conway won its first race of the season with a fine performance, earning Toyota Racing's fifth victory of the 2014 season. Anthony and Sébastien finished 11th after losing time due to a technical issue but nevertheless become the 2014 drivers' World Champions, holding an unassailable lead in the standings with only one race remaining. That marks Toyota's first drivers' World Championship crown since Didier Auriol won the World Rally Championship in 1994. Today's result also strengthens Toyota's hold on the manufacturers' World Championship, extending the lead over Audi to 40 points with a maximum of 44 points available in the final race, in Sao Paulo on 30 November. There was drama throughout the race, starting on the opening lap when Alex and Sébastien swapped positions with their rivals having started from fourth and second respectively. Despite losing ground at the first turn, the TS040 Hybrids soon asserted themselves and within seven laps the #8 had taken the lead thanks to some decisive driving from Sébastien, while Alex was in similar fighting mood as he moved into third. A brief full course yellow after 30 minutes gave both cars the chance to pit early for new tyres and more fuel. With the rest of the field circulating slowly, time lost in the pits was minimised and Sébastien resumed in third with Alex fourth. Both soon moved up a place and, close to the one-hour mark, took over at the head of the field, running one-two and setting similarly competitive lap times to pull clear. After 90 minutes both cars pitted on the same lap, with just nine seconds separating them. Mike took the wheel of the #7 while Sébastien handed over to Anthony, who resumed in the lead. That did not last however, with the #8 needing an unscheduled pit stop to change the alternator. That elevated Mike in the #7 to the lead, while Anthony resumed 30 minutes later in 26th, 17 laps behind. A further short stop to confirm the new alternator was functioning correctly soon followed before Anthony continued with a mission to finish the race and wrap up the drivers' World Championship. The target for the #7 was different and Mike continued to stretch the lead, which stood at close to a minute when Stéphane took over soon after half distance. Sébastien returned to the wheel of the #8 and made steady progress, setting the fastest lap of the race early in his second stint as Stéphane safely guided the #7 into the final hour before handing over to Alex. The #8 was rapidly rising up the order and lay 13th with 50 minutes remaining when Anthony took the wheel for his final stint. Both cars ran almost nose to tail during the final minutes, with Alex leading them over the line to win in the #7 by 50.460secs, as Anthony took the flag to make it a double celebration for Toyota Racing. "Congratulations to Anthony and Sébastien on becoming World Champions. They deserve the title, which is not just for the drivers themselves, but recognises a fantastic effort by the whole team. This is a really big prize, particularly because this year was the start of a new era of fuel efficiency. 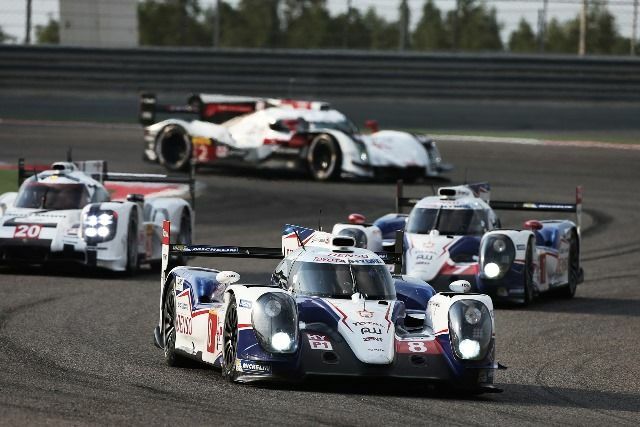 They are the first champions under these new regulations and we are very proud that the Toyota Hybrid System – Racing proved its performance by powering them to this title. Thank you to everyone who has been involved; all at Toyota Motorsport GmbH in Cologne, our colleagues in Motor Sport Division and the Hybrid Department of Toyota Motor Corporation in Japan plus our friends from ORECA and all our partners. Also I would like to pay tribute to our fans, who have been so supportive since the start of our project. Of course, big congratulations as well to Alex, Stéphane and Mike for their victory today. After a few races where various factors have hindered the #7, they were very quick and consistent today on a track which is one of the toughest on tyres. They did a great job." "I'm very happy for my team-mates on becoming World Champions. They have been mega all season. We work very hard together as drivers and there is a great atmosphere between us. Now they are the World Champions so they should enjoy it. We won the race so I am very happy with that. I must say thanks to Stéphane who pushed us in the right direction on set-up earlier in the weekend. We had a strong car and it was a good team effort." "Congratulations to Anthony and Sébastien. They have had an amazing season and they deserve this moment. I'm really pleased with our race and it's fantastic to win again, especially here in Bahrain where I won in the #8 last season. In my stint I had to save a bit of fuel to avoid needing a splash later in the race. I worked hard to manage the situation and did a good stint; it all worked out well. Alex and Mike both did a great job, in fact the whole team has performed really well this week and all season." "Well done to Anthony and Sébastien on sealing the World Championship. They have had an extremely strong season. Today was a great result for us in #7. Stéphane and Alex did some awesome stints and I am pleased with my performance. It's great to pay back the faith and support the team has shown me. To win my first WEC race, in only my second race with Toyota, is a great result and a great day. I will cherish this moment for a long time." "It's been an amazing year. For me personally this is the biggest achievement in my career by a long way so it is a big day. I have never been a World Champion before so this means a lot and it still hasn't really sunk in yet. The team did an amazing job and have given us the fastest car. It wasn't exactly the way we wanted to win the title but I'm not complaining. Big thanks to the mechanics today for getting the car out on track again, not only the #8 guys but also the crew from #7 who helped out. This championship has been a real team effort and I'm so grateful to everyone who has made it happen. It's a great day but there is still one more job to do in Brazil; win the manufacturers' World Championship." "I am really pleased; it's a great feeling to win the World Championship. It's not the way we wanted to get it but we are really happy. To win a championship when you are competing against Porsche and Audi is a fantastic achievement. We had the car to win the race but I'm happy #7 won. Thanks to the team because to win a championship you need a great car and that's what they gave us. Even if it is the drivers' World Championship, it is really a title for the team because without everyone here at the track, back at Cologne and in Higashifuji, Anthony and I would not be here today. If we can make sure we win the manufacturers' championship in Brazil it will be a fantastic year."